Do you want to maintain a healthy weight? Eating shortly before bedtime may not be as bad as you think. Maintaining a two-hour gap between your last meal of the day and bedtime is not associated with any long-term difference in blood glucose levels among healthy adults, according to peer-reviewed research published this week in the online journal BMJ Nutrition, Prevention & Health. The study published by two Japanese researchers suggests that people might be better off focusing on getting more sleep rather than attempting to avoid illnesses such as diabetes and heart disease by eating earlier in the evening and/or waiting two hours before sleeping. The research was carried out by Su Su Maw, a PhD nursing student at Okayama University in Japan and Chiyori Haga, associate professor in the Department of Nursing at Okayama University. Maw and Haga analyzed data from 2012 to 2014 for 1,573 healthy middle-aged and older adults with no underlying conditions associated with diabetes from one city in Okayama prefecture. Two-thirds of the sample were women and two-thirds were over the age of 65 and retired. The researchers also looked at how much people smoked, their level of physical activity, weight gain since the age of 20, whether they had a fast or slow eating style, alcohol intake and whether they skipped breakfast. They did not find a link between that two-hour gap between supper/snacks and bedtime and elevated blood glucose levels. They cautioned that their findings are correlational and do not speak to cause and effect. Avoiding eating a couple of hours before going to bed has long been thought to be better for long-term health. In fact, one study published last year by the Barcelona Institute for Global Health concluded that those who ate their evening meal before 9 p.m. or waited two hours before going to bed after eating reduced their risk of breast or prostrate cancer by 20 percent. 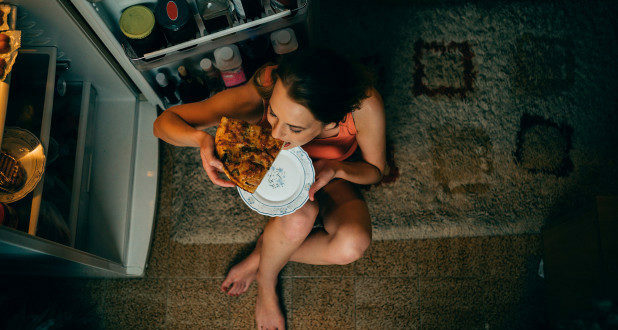 But other studies support the theory that late-night snacking isn’t always bad. Consuming 30 grams of protein about 30 minutes before going to bed appears to have a positive effect on muscle quality, metabolism and overall health, a separate study published last October in the peer-reviewed British Journal of Nutrition found. The study was carried out by Michael Ormsbee, associate professor of nutrition, food and exercise sciences at Florida State University and Samantha Leyh, a former graduate student at the university. That study’s participants were comprised of active young women in their early 20s. They ate cottage cheese 30 to 60 minutes before bedtime. Ormsbee and Leyh said this was one of the first nutrition studies where participants consumed a whole food as opposed to a protein shake or some form of supplement. “It gives people options for presleep nutrition that go beyond powders and shaker bottles,” Ormsbee said. Some caution for late-night snackers: Americans who are keeping tabs on their weight might do well to watch the clock. Sweet snacks such as candy, chocolate and ice-cream peak in the evening just after 8 p.m., according to previous research carried out by market-research company The NPD Group. Snacks that are “better for you” such as nuts, vegetable slices or fruits peak at around noon, followed by a slightly smaller rise in savory and sweet snacks at the same time of day.